It's time to enrol in Coder Academy! As you might have seen, my new book Coder Academy is out now. The book is mostly based on Scratch, the free coding language popular in schools. There's also a chapter about coding a web page. I was excited to get my author copies! Aimed at children aged 7-10 years old, the book uses a mixture of on-the-page and on-the-screen activities. For example, there's a section where you use the stickers in the back of the book to design a sprite, and see how to make it in Scratch. There's also a pattern to complete in the book that you turn into a tune in Scratch. In the back of the book is a poster, a coding pairs card game, press-out paper robots to assemble, and stickers for designing sprites and marking your progress through the book. I'm delighted with how the book has been received. How It Works magazine gave it a five-star review and said: "The need for youngsters to become coder-savvy is as important as ever. 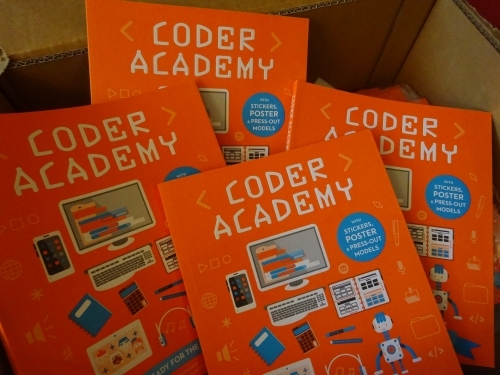 For those seeking to inspire the next generation to go down this important path, Coder Academy would make a most welcome addition to the bookshelf. Coder Academy... transforms a typically dry subject into something much more palatable through informative and enjoyable activities." The Week Junior made it book of the week and said: "If you're looking to code for the first time, then this book is the perfect way to get started." LoveReading4Kids made it non-fiction book of the month and said: "This well-designed, interactive workbook provides a really good introduction to coding for children. It breaks it down into fun, step by step exercises and each bright, visually attractive page sets children tasks to do, with sticker rewards when they get the answers right... As the author himself has said, coding is highly creative, and even without the press out robots on the end pages, this is a fun, appealing and stimulating approach to one of the key skills of the 21st century." TechAgeKids wrote: "Coder Academy is a fantastic activity book for tech-loving kids and would appeal to children from age 6 and up... We love the combination of coding, craft and design. Coder Academy would appeal to children with a wide range of interests and who are new to coding." Parents in Touch wrote: "With extras at the back of the book including a game, a pull-out poster, stickers, and even a robot model to press out and make, this is the must-have book for any future junior coders. It's straightforward and does not require any previous knowledge. Ideal for coding clubs in school as well as for home use." Thank you to all those publications and everyone else who has written a review or is otherwise helping to spread the word. Visit my Coder Academy mini-site for a free sample chapter, a Scratch sprite pack, desktop wallpaper, bonus content and more. You can find links to order the book here. Want to make a case for the Raspberry Pi that's environmentally friendly, cheap and requires no special equipment? Paper or card is the perfect material! To celebrate the publication of the fully updated third edition of Raspberry Pi For Dummies, we have created two new case templates you can use to house a Raspberry Pi 3, Raspberry Pi 2 or Raspberry Pi Model B+. The first design features the new For Dummies brand, showing the Dummies Man with a slick new haircut and glasses. Download the PDF template for the branded case here. It's not just the Dummies Man who's changed: the design of the book interiors has been completely updated too. Check out my PDF sampler of Raspberry Pi For Dummies to see what it looks like now. There's also a design with minimal branding that you can use for decorating your own case. In the photo, the case on the left was printed on coloured paper that had been painted by my son. I did also look to see whether there were any cool magazine adverts I could make a case out of, but it seems like music mags have far fewer full page ads than they used to. Tweet me your box art. I'll be curious to see your designs! Download the lightly branded case here. If you have an older Raspberry Pi, you can still download the original case we made when the first edition of the book came out. It features the old For Dummies branding, but will keep your Model B nice and snug in the cold winter months. Download the original Raspberry Pi case template here. (The new edition of the book still includes advice on setting up the original Raspberry Pi models, by the way - there are lots of them out there, and it would be good to think they can be put into service somewhere). The original paper case, called The Punnet, was designed by Ian McPhee, who kindly allowed us to create the branded version. Find out more about the new edition of Raspberry Pi For Dummies here. It's publication day for the third edition of Raspberry Pi For Dummies! Since the second edition was published in 2014, there have been quite a few changes in the Raspberry Pi world. Most obviously, there has been the launch of the Raspberry Pi 3 and the Pi Zero, but there have also been quite a few changes in the software. There's a new desktop, a new Python editor (Thonny), the release of Pygame Zero and Scratch 2, and the latest version of Sonic Pi. For this new edition, we've updated the book to reflect all these changes, and have updated the code throughout for Python 3. There's a new chapter on using Pygame Zero, and my co-author Mike Cook has completely rewritten the electronics section, including an introduction to GPIO Zero and Scratch so you can get your first circuit up and running faster. The Sonic Pi chapter has been updated for a greater focus on live coding and experimentation. We have tried to be as inclusive as possible, so the book aims to cater for the Model B+ and later, and provides pointers for earlier machines where possible. The set-up instructions include guidance for the original Model B and Model A, providing a comprehensive reference for setting up the Pi. The Scratch chapter introduces Scratch 2, but the main project uses the original Scratch which performs faster and is available on older Pi models too. The book still includes coverage of setting up your Pi, using the Linux desktop and shell environment, LibreOffice, GIMP for photo editing, Kodi media player software, Python, Scratch, programming Minecraft, Sonic Pi, and building electronics projects. It also includes ten inspiring projects and ten software packages to try. You can build a maze maker in Minecraft using the instructions in Chapter 13 of the book! Since we published the previous editions, the For Dummies series has been rebranded with a redesign inside and out. The new design looks much cleaner and more modern to me, so I think you'll like it. If you'd like to take a look, I've updated the free PDF sampler of Raspberry Pi For Dummies here. That includes two chapters, and the table of contents in full to give you an overview of the book. As always, thank you to everyone who has supported the previous editions of the book by buying it, reviewing it, and telling others about it. There wouldn't be a third edition without you, and it's been wonderful to create a book that has been so well received. Thanks also to Mike for bringing his electronics expertise, and the team at Wiley for all their work behind the scenes on editing, proofreading, project management and marketing. The book is available now to buy or order in real bookshops and online. You can find some links to shops stocking Raspberry Pi For Dummies here. There's lots more information about the book here.